Travel on airlines has become so routine for most of us, we often fail to appreciate what a true technological marvel it is. And it’s a costly and noisy marvel. Moving millions of passengers millions of miles each year requires an astounding amount of costly jet fuel and generates a significant amount of engine noise. 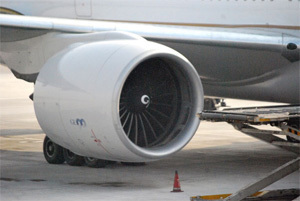 That helps explain why the companies that manufacture aircraft engines often find their way to the laboratory of Scott Morris, an associate professor of aerospace and mechanical engineering at the University of Notre Dame. 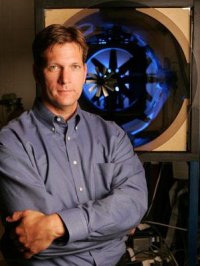 Morris conducts experimental research on turbomachinery and acoustics as part of the Institute for Flow Physics and Control, which is located in Notre Dame’s Hessert Laboratory for Aerospace Research. His work is aimed at helping the airline industry and the military to increase the efficiency of aircraft engines and reduce their noise. Morris and research assistant professor Joshua Cameron developed a turbomachinery laboratory that is focused on improving the components of gas turbine engines for propulsion and power system applications. The lab’s facilities include two transonic axial compressors and a high speed research turbine. These facilities feature single-stage rotating experiments that allow for advanced diagnostics and flow control under conditions that are similar to those occurring in full-scale aircraft engines. The lab also focuses on aeroacoustics, a field that involves fluid mechanics, acoustics, fluid structure interactions and vibrations. Experiments conducted in this area focus on problems such as airfoil generated noise and vibration, fan noise and the sound associated with active flow control devices. Turbine engine manufacturers and the military are keenly interested in developing quieter, more energy efficient engines and the Morris lab enables them to gain insights into engine performance that can result in savings of millions of dollars in design and operational costs. The research facility is growing significantly with a current staff of 20 and a calendar booked with experiments into 2014. The experiments being conducted in the Morris lab are leading to new discoveries that will improve both the energy costs and environmental impact of air travel. Originally published by William G. Gilroy at newsinfo.nd.edu on April 30, 2012.